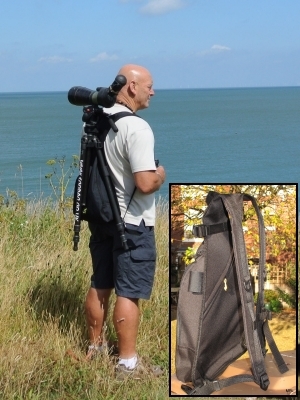 Useful weight saving device for carrying tripod and scope, includes integrated Digibag. This is the 2013 version to fit the Gitzo tripods or any tripod with or without a central column. This version is also better suited to carrying a heavy tripod and big lens combination, eg a Gitzo tripod with 600mm F4 lens. Made of hard wearing nylon, the design allows the tripod legs to become the frame of the unit. Once fitted to the tripod, the Scopac is not required to be removed. A useful zipped pocket allows a note book or field guide to be carried. An ideal weight saving tool which should be of use to all birders who carry a heavy tripod and scope combination. Weight approx 400grams. •The only way to carry your tripod and telescope. •A must have accessory which converts your tripod into a backpack. •A comfortable, functional design created by Birders for Birders.